Dec. 8, 15, 22, Sat. noon. Luncheon at the Oscar Swan mansion with food and décor each representing a different culture: Germany, Mexico, New Orleans and Italy. Santa will drop by. $29; call for reservations. Oscar Swan Country Inn, 1800 W. State St., Geneva, (630) 232-0173, oscarswan.com. Dec. 7, 6 p.m. Holiday shopping, dining, roasting chestnuts, strolling carolers, freshly made candy canes and hot cider. First, Santa Lucia, the Swedish symbol of the season, and her attendants arrive by horse-drawn carriage. Santa lights the Great Tree and opens his Gingerbread House at 6:30 p.m. Downtown Geneva, (630) 232-6060. Dec. 7-8, Sat. 11 a.m.-8 p.m., Sun. to 4 p.m. Five distinctive homes decorated for the holidays will open their doors to visitors for self-guided tours. A traditional tea at the Congregational Church in Geneva, and a keepsake decorating and entertaining ideas booklet are included. $30. Info/Tickets: Geneva Chamber of Commerce, (630) 232-6060, genevachamber.com. Dec. 8-Jan. 7, Thurs.-Mon. 10 a.m.-4 p.m. Enjoy the house decked in greens, savor the aroma of holiday treats and see the table set for company. Tours on the hour. Kline Creek Farm, 1N600 County Farm Road, West Chicago, (630) 876-5900, dupageforest.com. Dec. 8-9, 15-16, noon-6 p.m. Take a magical train ride and visit with Santa Claus and his elves at the Toy Workshop. Children on Santa’s “Good” list will recieve a gift. Special Fare Event; no passes honored. Museum/buildings not open on these days. Illinois Railway Museum, 7000 Olson Road, Union, (815) 244-7245, irm.org. Dec. 8-9, 2-6 p.m. Enjoy the cozy hearth and the scent of fresh evergreens while experiencing 19th-century Christmas traditions. Then, stop in at the 1872 one-room Sholes School, open 2-5 p.m. $3/$1 children. LeRoy Oakes Forest Preserve, 37W370 Dean St., St. Charles, (630) 377-6424, ppfv.org. Dec. 9, 5-7 p.m. Search for sights and sounds of the owls that reside at Glacial Park during the winter. Enjoy a hike through the forest preserve, then listen to an indoor presentation and meet a live owl. Dress for the weather and be prepared to walk about a mile over hilly terrain. Lost Valley Visitor Center, Glacial Park, 6316 Harts Road, Ringwood, (815) 338-6223, mccdistrict.org. Dec. 11, 7-8 p.m. Learn how to dress, where to go, and equipment needed to snowshoe in McHenry County. Staff from 2K Adventure Gear showcase winter gear and share advice. Lost Valley Visitor Center, Glacial Park, 6316 Harts Road, Ringwood, (815) 338-6223, mccdistrict.org. Dec. 20-31, 6-8 p.m. Grab hot chocolate and a warm blanket for this self-guided car tour around St. Charles, to view the most dazzling holiday decorations. Guides available starting Dec. 20, online or at Pottawatomie Community Center, 8 North Ave., St. Charles, (630) 513-6200, stcparks.org. Dec. 15-16, 1:30-3:30 p.m. Behold a Victorian Christmas, and learn the origins of several holiday traditions. Visit with an old-fashioned Santa, and take your picture in a sleigh. Stop by a warming fire for caroling and hot apple cider. Free. Kline Creek Farm, 1N600 County Farm Road, West Chicago, (630) 876-5900, dupageforest.com. Dec. 15, 29, 11 a.m.-3 p.m. See the farrier tend to the horses’ hooves and learn about the tools & techniques of the trade. Demonstrations ongoing. Danada Forest Preserve, Equestrian Center, 3S501 Naperville Road, Wheaton, (630) 668-6012, dupageforest.com. Dec. 21, 6-7:30 p.m. Welcome the arrival of winter with folklore activities and wassail around a campfire. Dress for the weather. Register by Dec. 20. Meet at Borland Cabin. Ryerson Woods Conservation Area & Visitor Center, 21950 N. Riverwoods Road, Deerfield, (847) 968-3321, lcfpd.org. Dec. 21, 6:30-8 p.m. Investigate old ways to celebrate this celestial event while creating new ones, including a luminary night hike ending at a campfire. Dress for weather. Please do not bring flashlights. Registration required; under 14 must be with paid adult participant. Prairieview Education Center, 2112 Behan Road, Crystal Lake, (815) 479-5779, mccdistrict.org. 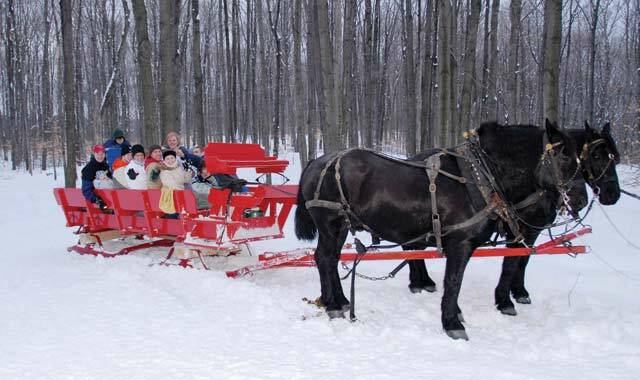 Dec. 26-30, noon-2 p.m. Take a 12-15-minute sleigh ride through prairies and woodlands and learn about the features of this historic preserve. Hay wagons used with fewer than 4 inches of packed snow on the trail. $5/$2 ages 5-12. Danada Forest Preserve, 3S580 Naperville Road, Wheaton, (630) 668-6012, dupageforest.com. Jan. 5, 11 a.m.-2 p.m. Learn from experts about safety, techniques, equipment; see demonstrations; shop vendors; fish and play games; food and beverages available. Four inches of ice required. State fishing license/trout stamp required for ages 16 and up. Lake Atwood, The Hollows Conservation Area, 3804 U.S. Hwy. 14, Cary, (815) 479-5779, mccdistrict.org. Jan. 11, 7-8:30 p.m. Search for owls during a short hike as they claim territories and mates during the winter months. Learn more about them through stories and folklore. Dress for the weather. Simultaneous but separate “Owl Prowl” for children ages 6-13. Both at Prairieview Education Center, 2112 Behan Road, Crystal Lake, (815) 479-5779, mccdistrict.org. Jan. 12, 1-2:30 p.m. Following an introduction around the campfire at the pavilion, head out on a scavenger hunt to find winter plant life and signs of animal activity. Registration required; under 14 must be with paid adult participant. Picnic Grove No. 1, The Hollows, Cary, mccdistrict.org. Jan. 13, 10-11:30 a.m. Search for clues about what wildlife has been around and make your own animal track cast. $10/family; $15/nonresident family. Ryerson Woods Conservation Area & Visitor Center, 21950 N. Riverwoods Road, Deerfield, (847) 968-3321, lcfpd.org. Jan. 18, 7-8:30 p.m. Around a campfire, learn to identify major constellations, and listen to the stories behind them. Dress for the weather. Registration required; under 14 must be with paid adult participant. Brookdale Conservation Area, 18410 U.S. Hwy. 14, Woodstock, (815) 338-6223, mccdistrict.org. Jan. 19, 1-2:30 p.m. Youngsters can learn about animal clues and behaviors while following tracks in the snow. Entire program is outside, so dress for weather. For kids without adults. Rush Creek, 20501 McGuire Road, Harvard, (815) 479-5779, mccdistrict.org. Jan. 19, 4-5:30 p.m. Join a dusk hike to search for signs of this Illinois endangered species. BYO binoculars; dress for the weather. Short presentation first. Registration required; under 14 must be with paid adult participant. Lost Valley Visitor Center, Ringwood, mccdistrict.org. Feb. 2, 1-2 p.m. See what groundhogs really do in February; games and activities inside, followed by a short hike through the woods. Dress for weather. Age 4-13. Registration required; must be with registered adult. Lost Valley Visitor Center, Glacial Park, Ringwood, (815) 338-6223. Feb. 8, 7-9 p.m. This ornithologist with the Illinois Natural History Survey in Burwood discusses owl behavior and identification, followed by a night walk to look and listen for owls. Dress for the weather; BYO flashlight/binoculars. By Friends of Ryerson Woods and Chicago Botanic Garden. Registration required: (847) 835-5440, chicagobotanic.org. $37/$29 for FRW or CBG. Event: Ryerson Woods Conservation Area, Deerfield, (847) 968-3321, lcfpd.org. Feb. 9, 2:30-4 pm. Explore the winter wilderness during this guided forest preserve walk with activities along the route. Dress for the weather. Reg. required; under 14 must be with paid adult. Coral Woods, 7400 Somerset, Marengo, (815) 479-5779, mccdistrict.org. Feb. 10, 11 a.m.-noon, 2:30-3:30 p.m. Learn about this former Illinois governor, presidential candidate and Libertyville resident and tour his historic home. Ages 8 and up. Adlai E. Stevenson Historic Home, 25200 Saint Mary’s Road, Mettawa. Info: Lake County Forest Preserve, (847) 367-6640, lcfpd.org. Feb. 14, 7:30-9 p.m. Learn wildlife courtship behaviors in a guided hike or self-guided ski/hike, then warm up with hot chocolate and s’mores. Borland Cabin, Ryerson Woods, Deerfield, lcfpd.org. Feb. 17, 8:30-10:30 a.m. Breakfast and coffee followed by a hike in search of winter birds. BYO binoculars, field guide. Lost Valley Visitor Center, Ringwood, (815) 338-6223, mccdistrict.org. Feb. 17, 10 a.m.-noon. Learn a little history about this ancient sport while developing your skills, and then practice in the forest preserve. BYO ski equipment. Dress for weather. Dependent on conditions. Raven Glen Forest Preserve, U.S. Hwy. 45, Antioch, (847) 968-3321, lcpd.org. Feb. 23, Sat. 10 a.m.-5 p.m. Two floors filled with nearly 75 vendors with vintage clothing, jewelry and textiles. Fri. sneak peak with cocktail bar, clothing contest, live rockabilly. Hemmens Cultural Center, 45 Symphony Way, Elgin, (847) 931-5900, hemmens.org. This entry was posted on Monday, December 10th, 2012 at 11:57 am	and is filed under Recreation & Destinations. You can follow any responses to this entry through the RSS 2.0 feed. Both comments and pings are currently closed.